Sir Patrick Moore Interview - Universe Galaxies And Stars Section. 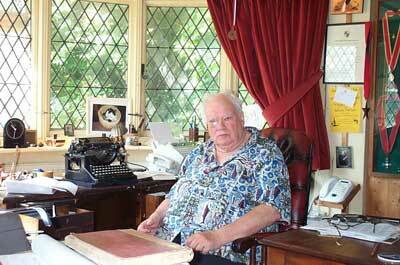 A Brief Interview With Sir Patrick Moore. TV host Sir Patrick Moore has popularized astronomy for almost half a century in the United Kingdom and around the world by presenting his monthly Sky at Night program without a break - a slight episode of food-poisoning earlier this year that meant Patrick missed a program, but he made a full recovery. Patrick has also written over a hundred books and thousands of papers on the subject, and was working on a new project when Richard Pearson caught up with him at his East Grinstead home. Richard Pearson: How are you doing? Have you made a full recovery? Sir Patrick: I am still here! Yes that was a nasty business and people had written me off at the time, however, I have made a good recovery. It was all caused by a duck egg, fortunately on this occasion I won, so yes I have. Very sadly, I have a crack in my spine, which over the last five years has prevented me from doing any kind of astronomical observations through my collection of telescopes, and during the war I had a knee injury which also causes problems now. Have you been surprised by any changes in Space exploration since you started presenting the Sky at Night almost 47 years ago? I had expected manned exploration to continue after the Apollo program, and sadly the Space Shuttle has caused some problems leading to the loss of life, and the manned exploration of space seems to have stalled. I was most surprised that the robotic exploration of our solar system has sprinted a head, and today space probes have visited all of the planets, except Pluto. I did not think that such interplanetary probes would be able to travel as far as the planets Uranus or Neptune in the early Sky at Night days. David A. Hardy once painted two space suited humans on the surface of Titan, looking up through a sky tinged green with methane at the parent planet Saturn. By 1978, he had painted a dirigible cruising through red smog, Saturn barely visible. Both represent the best available science of the time. Today the Cassini Huygens Space probe has sent back a series of remarkable images of the Moon, and we now believe there are strange Cryogenic (Cold) volcanoes on its surface. In your new book, Futures: 50 Years in Space, you state that Europa could contain life if the sub-ice seas do exist there. Do you believe that this may be our best chance to find extra-terrestrial life? Or do you believe that we may find life "out there" first through the work of organizations such as SETI? Yes I did say that, however, I believe our best chance of finding life in our solar system is on the planet Mars. We now know that a lot of water once existed on this planet sometime in the past, and the latest surface rovers (Spirit and Opportunity), along side orbiting space probes like Mars Express, have shown that the Martian conditions are more favorable for life to evolve their today than at any time in the past. If the conditions are right, life will always find a way to exit. So right now, Mars is my number one choice." I am sure there are many people who are curious to know who you would pick to (eventually) replace you to become the future presenter of the BBC's Sky At Night program... Could this be Chris Lintott? I really do not know because it is not my decision. Chris Lintott is a very good speaker and comes across very well indeed. I had Chris on the program earlier this year, and he did very well, so I now have Chris Lintott on The Sky at Night more often. If you're interested in Futures: 50 Years in Space, please read Universe Today's review. You can also visit Amazon.com to read more reviews, or purchase a copy online (or Amazon.co.uk). You can also BBC's website for Sir Patrick Moore's "The Sky at Night". Sir Patrick Moore was interviewed by Richard Pearson.